We have lots of fans of The Diary of a Wimpy Kid series by Jeff Kinney. I had informed our students about the details of Jeff Kinney’s visit to Australia and some very keen boys went along to see Jeff. This is what they had to say about their exciting day…. Matteus and Oliver in 4VL and William in 2TM visited Jeff Kinney at the Melbourne Town Hall on Sunday, May 20th. We went to see Jeff Kinney because we like him as an author. He told us about how he made Diary of a Wimpy Kid and the process he went through to make the books. His books were supposed to be for adults , but they turned out to be for kids. After he spoke we waited for him to sign our books. It took quite a long time until he could sign them. We all had a lot of FUN!! Do you have a question you would like to ask the boys? This entry was posted in Uncategorized and tagged "Jeff Kinney", Wimpy_Kid by smotlrcblog. Bookmark the permalink. 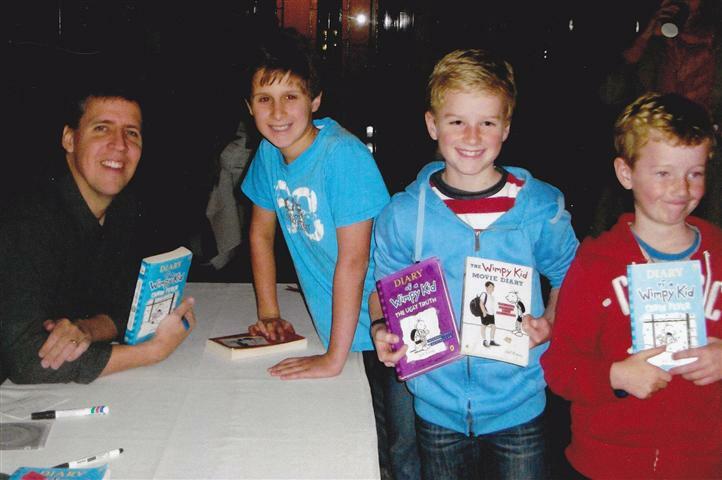 OMG I am so jealous that 3 kids from SMOT got to see Jeff Kinney. I have a big week this week because tomorrow I have the school photos then on Wednesday I have the book fair and on Thursday I have book character day when you have to come to school as your favourite book character. For homework I have to make pavlovas to share with the rest of the class and my teacher. I was so thrilled to see that the boys booked their tickets to meet Jeff Kinney. It is exciting to meet an author you really like! My goodness you do have a BIG week ahead of you! We had school photos last Thursday. What book character are you going to dress up as this year? Do you have your eye on a good book to buy from your Book Fair! I’m dressing up as thing one I’ve even got a wig and and some face paint to make sure I look awesome. How exciting to visit your blog and see that some of your students had the chance to meet Jeff Kinney! I know nearly every boy at my school would have loved that experience! My question is now that time has gone by, what question do you wish you had asked? We are finishing our year now! I’ll have time to visit your blog more this summer! Wow how great that you three boys got the chance to meet up with Jeff Kinney. I do have a question I was wondering did Jeff Kinney act like any of the characters in his books? Sorry for not visiting more Miss Y but have been doing a course and have just completed so hopefully will have more time to visit your wonderful blog. I, know holidays are coming up really soon so have a wonderful holiday. The boys were so excited to meet Jeff Kinney in person! Congratulations on finishing your Teacher Aide course. The students you will get to work with be very lucky! That must have been a great thing to go to. I am so jealous and I wish I went! I am so happy for the 3 of them, and I hope they had fun. It would have been great fun to meet Jeff Kinney. What question would you have liked to ask Jeff? I would ask Jeff Kinney did you get your idea for diary of a wimpy kid from your childhood or from an other person or just make it up?